Studying God's Word is a critical element of our Christian journey. 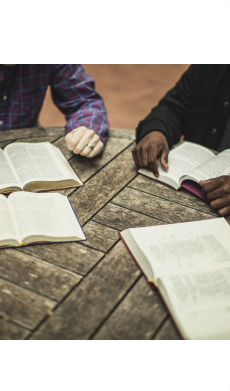 Studying the Bible in fellowship with other Christians is an encouraging learning experience. A Women's Study group meets Tuesday at 9:15 am and is now studying Spiritual Gifts. A Men's Study group meets Friday at 9:00 am. The men are currently studying the book of Acts in the New Testament. In addition, a new study group continues on selected Wednesdays at 6:30 pm in the Library entitled, "The Attributes of God" by A. W. Tozer. Facilitated by Joy Caldwell, it will include a time of prayer that will focus on the needs of the individual, the church and the community. Watch for our new batch of studies for Fall '18!! !